Keyboard troubleshooting: is “Sticky Keys” on? Yesterday I received a call from someone who was rather distraught and frantic (this happens from time to time at my Tech Support business) because, all of a sudden, they couldn’t type on their computer. Actually, she could type.. but she was getting very strange results. After determining that she had not recently poured an extra-large Cafe Latte on her keyboard (to read my article on what to do if you do spill on your keyboard, [or, if a single key has stopped responding] click here), and asking some other diagnostic questions, I determined that she had accidentally turned on Windows’ FilterKeys feature and simply needed to turn it off again. FilterKeys is a subset of keyboard “Accessibility Options” included in Windows to assist people who have difficulties typing. These tools are activated (toggled on and off) by keyboard stroke combinations (shortcuts). 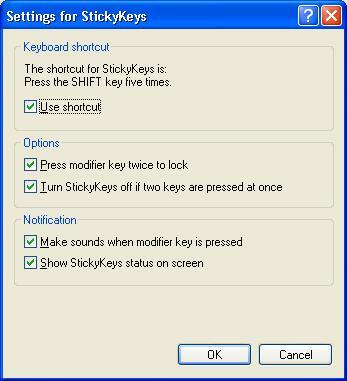 StickyKeys is an accessibility feature designed for people who have difficulty holding down two or more keys at a time. When a shortcut requires a key combination such as CTRL+P, StickyKeys will enable you to press one key at a time instead of pressing them simultaneously. 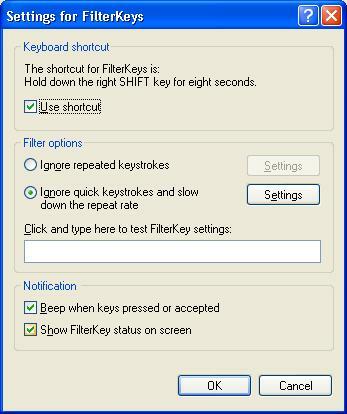 FilterKeys: You can set Windows to ignore keystrokes that occur in rapid succession, or keystrokes that are held down for several seconds unintentionally. Bounce Keys: If you bounce your fingers on keys inadvertently, Bounce Keys will ignore repeated keystrokes until some time has passed. You choose the time period. Repeat Keys and Slow Keys: The computer will ignore brief keystrokes according to the time limits you set. To access these Options and turn them off or on, go to your Control Panel– click Start >Settings >Control Panel >Accessibility Options. By default it opens to the keyboard tab. If you are experiencing a sudden onset of bizarre typing behavior, your first step is to visit here and ensure that there are no checks in the three checkboxes, which indicates these Options are in use. I mentioned that shortcuts ‘activate’ these features — such as Tab+Enter, and a couple of Alt+a letter— and so you may have turned them on unintentionally. If you do have some difficulty with your typing, such as happens when a Mr. Arthur Itis comes to visit, or/and if you have tremors, here is where you can enable these aids and tweak their settings to get the most benefit from them. Click on the “Settings” button to see the choices. Below is the FilterKeys Settings dialogue. In the case mentioned, my client had first held down the Shift key long enough to activate FilterKeys (because a finger “rests” there). The lady was an extremely fast typist, and this setting ignored her strokes as being too short. Since she has no use for this tool, I recommended that she uncheck the top checkbox and disable the activating shortcut. 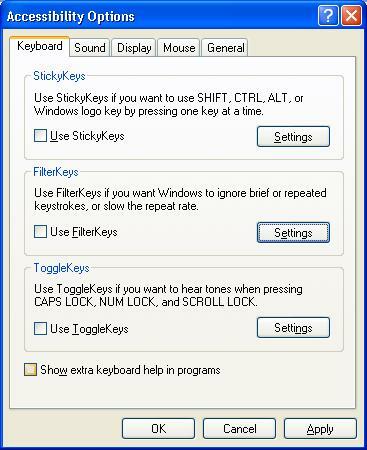 This screenshot shows the settings for StickyKeys, and unless you have trouble holding down more than one key at the same time — such as Ctrl+Alt+Del to activate Task Manager — I suggest you uncheck the top checkbox here as well. For more on the keyboard Accessibility Options, click here. Today’s free link: Loyal readers of this daily How To series know that I have a certain sensitivity to how the marvels of today’s technology has had an affect on our civil liberties and privacy. If you share my concerns, you should be aware of the Electronic Frontier Foundation, an organization looking out for us in this arena. Take a look and see the latest headlines and concerns, and see how they’re defending your rights. Do you appreciate all the free advice and links to safe and free software I provide six days a weeks–ad free? Do your friends (and me) a favor and let them know about Tech–for Everyone. my keyboard decided to quit working after a grandson installed a hunting game which require use of the shift key to move the hunter…I have tried to remove stickykeys through the control panel and have been most unsuccessful what else can I do? Boys and their games, eh?! If the keyboard is attached via a USB cable sometimes simply unplugging it, counting to 5, and re-plugging it in again will correct weirdnesses. Similarly, if you are using a wireless keyboard, changing the batteries will fix little glitches (it is possible the game install is not related). so i was playing World of Warcraft earlier tonight when my escape key decided to stop working. it has happened before but i dont remember how i fixed it. the caps lock key and the F-lock key soon followed, i believe it has something to do with sticky keys but cant figure out how to reset everything back to normal. some help would greatly be appreciated so i dont have to buy a new keyboard tomorrow. But, follow the advice above to uncheck the “Use shortcut to enable..” checkboxes to disable the features, just to make sure. If I understand your unusual request correctly, you might find ASCII Code Generator useful http://www.download.com/ASCII-Code-Generator/3000-2383_4-10116298.html?tag=pub&cdlPid=10116299 but, this is written for Windows 98 (the Windows 9x series– Win 95, 98, ME) it will probably work on all Windows platforms. I have to ask.. what do you need this ability for? I spilled some juice on my laptop and now a few keys do not work. So I cleaned it but the keys still do not work. On my laptop, when I’m trying to scroll to a location of a file lower on display, it immediately zipped back to the top of the list of files. Also, the scrolling is extremely slow in other programs and on the internet. I’ve tryed using a canister of compressed air to blow out any trash. Wasn’t the problem. You’re right; that would only help you if you were using the PgDn key to scroll, and there was some gunk under there that prevented full key depression. If you are using a touchpad to scroll, you might want to install the latest drivers, and see if that doesn’t cure your machine’s misbehavior. Click on my “Device drivers” category to see my articles on installing drivers, if you need guidance. And although this is a rare symptom, it may be an indicator of malware. I would suggest you visit Trend Micro’s Housecall and run a scan. I have this strange problem with my brand new keyboard. While every key seems to be working well as a unit, when I try some specific combinations, the keyboard does not respond. For instance, if I press & hold the down+right arrow keys, these four keys: “q”,”w”,”j” and “k” are not responding. The rest keys respond perfectly, so I assume that this is not a “number of simultaneously pressed keys” issue. Anyway, you can imagine how annoying is this especially in games that you need to use the directional and letter keys as well… Do you have any idea of what causes this kind of problem? First, follow the steps in this article to make sure that NO “Accessibility Options” are enabled (as shown in the first image).. that is, no checkbox is checked. Then, make sure you have the latest device driver from the manufacturer’s website installed. While you’re on the keyboard manufacturer’s website, look on the FAQ and/or Support page for a description of this issue. If these things don’t clear up the problem, contact the manufacturer. It may be you have a slight defect..
My wireless keyboard started to act weird today. It typing the letter x repeatedly. I changed batteries and check all of the obvious things. Even if i tried to back space it would just move forward with a row of x’s. When asking for free troubleshooting advice, it is good manners to provide some basic details.. The norm is to at least provide the operating system XP/Vista/Mac/etc.. and also when it is a device that’s misbehaving, the make/model. That is kind of unusual behavior, isn’t it? First of all, the ‘Sticky Keys’ article is not for this kind of malfunction, but the link provided (2nd paragraph) is. Please follow the cleaning steps found there first. (You may have to remove the keycap). If that doesn’t resolve the issue, unplug the USB/base station, go into Device Manager, and uninstall the keyboard. Then reboot. When you are booted, and can see your Desktop, plug the USB back in. You should see a “Found new hardware” dialogue installing the keyboard’s driver. If that fails to resolve the issue.. I would need to ask you some questions before offering any further advice. I thank you for taking the time to post this nice comment on my humble tech blog… Glad it helped you. Thank you very much. I am able to type at regular speed now. Great job. I’m glad you found my site helpful. I recently bought an eee pc laptop. When I turned it on today the keyboard was not working. I installed avg anti virus software yesterday so I thought this might have something to do with it. I uninstalled it but it still refused to work. Im confused with reguards to the problem. Its not old enough to be a dust or damage problem. Is there some way I might have locked the keyboard by mistake or is it an internal problem? Is it a Linux unit, or XP? Is it still under warranty? If it’s XP, you can try using System Restore (How To Use System Restore To Fix Windows to go back to a date when it was working.. and also look in Device Manager for your keyboard’s driver status. If you can find a USB keyboard, plug it in and see if it works. That will help in your troubleshooting. Sorry, though, I don’t troubleshoot Linux. The various User Forums are your best bet. my child was on the computer now whenever i press the space bar down it opens the search results page how do i make things normal? The proper procedure would be to track down just what your child did, and then un-do it. (It sounds like they set a hotkey assignment). Since I am not looking at your machine, perhaps the easiest thing would be for you to “go back in time” to before this happened using System Restore. When asking for help, it is … um, standard practice to state the operating system, and the make and model of unit. My answer might be different between a Mac and a Windows XP and a Windows Vista.. i.e.. But I am going to answer assuming your PC is a Windows machine. Your problem may be mechanical and it may be software-related. If this is a quite recent development, the fist thing to try is System Restore – choosing a date prior to the malfunction. If that doesn’t resolve the issue, next go into Device Manager and Uninstall the keyboard; then reboot (restart) the unit. Windows will “detect” the keyboard and re-Install it at startup. Of course, the problem may be mechanical, in which case I recommend replacing the keyboard assembly. While this can be done as a D-I-Y, I advise taking it to a qualified technician. I have windows XP. Yesterday our very old keyboard stopped responding, so I bought a wireless one. The keyboard assigned keys worked (Home, calculator etc) but none of the alphabetical or numerical keys. I tried lots of things (re-installing etc) but in the end returned it to the shop and exchanged it for a plug in USB keyboard. This new keyboad is doing EXACTLY the same thing! Only the previously assigned keys are working (home, calculator, volume etc) and none of the alphabetical or numerical ones. The new keyboard is plug and play. I have tried three different USB ports and still no joy. THere is no CD or insallation disc. My articles on device drivers are here, https://techpaul.wordpress.com/category/device-drivers/, and you may need to scroll past a few to find the appropriate How To.. but it’s there. You are amazingly quick – thank you. Sorry to be stupid, but my old keyboard was plugged in with a PS/2 connector but I am unable to find the drivers in the device manager list as I can’t work out which is the relevant bit to click on and it isn’t obvious to me which one it is. In Device Manager there is a category labeled “keyboards”. Click on the + sign to ‘expand’ the keyboard category. Right-click on each entry you see there, and select “Uninstall” (answer “yes” to any warning dialogue). Power down the computer when finished. Plug in the new keyboard, and then power on again. Windows will detect the new keyboard and install the appropriate drivers. Ah!! Maybe this is the problem. There is no keyboard category. I have also tried looking with the new keyboard plugged in or not and whichever I do there is no keyboard drop down. Please reboot the computer with the keyboard plugged in. Them make sure you are not seeing “keyboards” in Device Manager. Click Start > Run and enter devmgmt.msc. If there is no keyboards category now, you can try the Add New Hardware wizard (found in Control Panel) and tell it you are adding a keyboard. You can also try opening a Command Prompt and running “sfc /scannow” (no quotes) and then repeat the steps. Have tried all this but still not working. THank you for your help I will try and get someone in, California is probably a bit too far from the UK! Here’s one more thing to try. Visit the keyboard manufacturer’s website, and see if there is not a driver for XP available for download. Every time I press my control key, it launches Internet Explorer. I went to accessibility options and “StickyKeys” in not on. What can I do to return the control key to normal? I have no idea of what you did to the computer to initiate that behavior, but if you know (or can guess) what that was, you might try un-doing it (perhaps with System Restore). You might also try the technique mentioned here, What To Do When Your Mouse Plays Dead. Or Your Keyboard. I have a prob in logging in via win XP pro. the sticky keys get activated…and i have to deep press the digits to get it typed and then enter. I tried disabling sticky keys everything. Doesnt help. Also the cursor goes thick black while blinking. 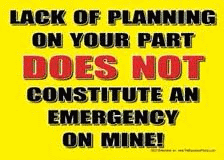 please advise…. I have to assume you changed the settings as Administrator, yet they revert. I would start by making sure the machine was clean of malware. My next step would be to open a command prompt and run both sfc /scannow and dskchk /f /x. well….I was the administrator in this case and i tried cleaning up the system and performing a malware check too (malwarebytes). Other stuffs like the tabs and the toolbars, seems fine to me, but the problem is only during the windows login. I get that big font when i click the password area and you cannot enter any characters. only if i press and hold the key, the password enters in. I tried a system restore too…but in vain. This is not a problem whose answer helps “everyone”, and so you are asking for free support. I do not provide my professional support outside N. America. I am going to tell you that the only (few) times I personally have encountered your issue was on bootleg copies of XP (which I do not support) or on malware infected systems. * Run sfc /scannow from the command prompt. * Visit an online antivirus scanner and perform a Full system scan — I prefer Trend Micro’s Housecall. * Create another User account and use it to logon. * Change the way you logon (so that entering a password isn’t required [“auto logon”]). * Perform a repair install of XP. * Take your computer to a qualified tech. please help me with my netbook problem, it’s ASUS eepc series with microsoft windows XP.. it was bought i think just last year and now most of the keys are malfunctioning, either it cant be pressed or other keys will appear.. i’ve tried this tip but it didnt work.. i’m afraid i broke something from the USB socket on the side of the laptop, and now im thinking it may caused all of this.. but all the USBs i inserted are still working well, do you think it would be solved by more of your tips? or it’s a hardware malfunction now? First, I would try the method described here, What To Do When Your Mouse Plays Dead Or Your Keyboard. But, to be any more specific, I am afraid you would have to hire me (or another technician) to look at your device. Yes, it could be a hardware problem. Maybe.. you have to “reset” it to factory condition (wipe the hard drive and reinstall Windows) and maybe not. Also, if you are familiar with forums, you might try posting your question on the eeepc user forum, here. This sounds like a hardware issue. While shutdown, disconnect all external hardware, except KB, mouse, monitor. Also remove any floppy disks or CD’s. See if that helps. If the problem still persists enter the BIOS and Enable “legacy USB devices”. If that fails, you can use your favorite search engine to search for the string “log in to windows with mouse”. Please read What To Do When Your Mouse Plays Dead. Or Your Keyboard. I wonder if anyone can help, I pressed and held the shift key down for to long and a box popped up I cant remember what I clicked but since then my keyboard wouldnt work, I can make it work by pressing and holding the shift key down for about 8 secs until my comp makes a funny noise then I can type normally, when I log out and back in I need to do this again before I can type. Any ideas how to stop it from happening? The answer is in the article. This is a “Accessibility Options” (FilterKey) and you should go into Settings (in Control Panel > Accessibility Options). Open ‘accessibility options’ & select ‘Settings’ un-select ‘use shortcut’ & apply it, the problem should be solved. I checked my setting which are just fine, I didn’t spilled anything on it (plus it’s a 6 month old laptop so it can’t be dust, I did a complete and extended scan with Avast which came up clean and I turned my computer off and on… It did the same thing couple of days ago but the problem disapeared after 2hours of trying to solve it (and surely without having any idea on what I did to fix it). I have an azerty keyboard on a ASUS K53SC SX050V – Pentium 2 GHz laptop. hum, sorry, I’m on window 7. Thank you in advance for any help! Check to make sure the language is correct in Control Panel > Regional and Language Options > “Change keyboard and other input options” (opens “Text Services and Input Languages). If you installed any keyboard mapping programs/utilities lately, uninstall them. Refer to the article mentioned in my answer to morgan (above). Call the laptop manufacturer (a 6 month old laptop gets free support). Waouh, that’s a fast answer! thanks a lot, but it still doesn’t work….. I guess I’m good for longterm trouble with the manufacturer… anyway, thanks a lot and have a great evening (or day, depending on where you live). Well, you can hire a pro to look at it, but I think ASUS phone support will prove less painful than you might think.. and you already paid for it. I have to keep tapping the keys over and over to get it to write the keys do not seem to want to work. this does not do it all the time its very bad doing e mails it is taking for ever to write. it mises out letters if I dont watch it all the time. thank you Carol. I have about a 3 year old dell laptop (windows 7). My “V” “h” and “C” keys are not working in my browser, but they will work in Word. I looked and none of the Accessibility Options are on. Do you know what it might be? Thanks! I have not seen or heard of this on a Windows 7 machine (yet), but on a laptop, holding down the Fn (function) key and pressing the Windows logo key has worked for me in the past. This article http://jamesisin.com/a_high-tech_blech/index.php/2008/03/keyboard-input-ignored-for-c-h-t-and-v-keys-in-specific-applications-only/ closely matches my (limited) personal experience, and has a few other useful suggestions. 1. A double-tap of the Windows (or Super) key. 2. A double-tap of specifically the right Super key. 7. Fn key and Super key may toggle problem on and off. delete all keyboards other than your language and delete all instances of “Ink Correction”. But I have no idea what keyboard you are referring to (and there are thousands). Typically, gentle pressure, and they should ‘snap’ into place. If that hasn’t worked, go to the device manufacture’s Support pages, and search using the keyword “keycap”. so my issue is, my computer’s keyboard will either not type and just sit there and eventally will let you type, then when you get to punch a few keys in it repeats whatever key it feels like over and over forever ex: wwwwwwwwwwwwwwwwwwwwwwwwwwwwwwwwwwwww……. i took it to the shop they formated it and charged 115.00 turned it on today and what do you know same thing , its not they keyboard i have used 3 different ones brand new. anyone have any idea what it could be? i tossed out the usb keyboard and went with the old keyboard and works perfect… idk if there could be something with whatever controls the usb but its working perfect now. I guess I assumed from the way you posed the question, that your keyboard troubles happened to a single keyboard, and happened even though it had just had Windows re-Installed. What if it’s a Mac ? Some of keyboard troubleshooting techniques discussed here (and in the Comments, above) can be applied to Apple products – in a general kind of way. The first step is giving the keyboard a good cleaning.. maybe a vacuuming. If, when you banged the keyboard on the desk a bunch of grit/sand/rice grains/etc. did not fall out, then perhaps a sticky fluid got under the keys and dried.. in which case, the “bathtub trick” (or dishwasher trick) may be a good thing to know about. But if it is no longer broke.. don’t fix it. Glad to hear you got it resolved. We have no more “Accessibility Options” in the Control Panel of W7. Are there any plans to update this page here? Though they changed the name (in Windows 7) to “Ease of Access Center“, and the option name to “Make the keyboard easier to use“, everything else is the same.. so, sorry but no, I am in no hurry to update all my prior articles (1,800+ of them) to reflect Windows 7 (nor 8) ‘adjustments’. In Vista, but more so in Windows 7, and it’s practically mandatory in Windows 8, they want you to – instead of looking for an icon (or word in a menu list) – type what you’re looking for into the Search pane (above the Start button); whether that be a document you worked on recently, or a program you want to launch, or, whatever. So if you do not see “Accessibility Options” or “Ease of Access Center”, click Start and then start typing in a-c-c-e-s-s. It will appear in the list of results by the time you get to the 3rd “c”. Looking for an icon (aka “hunting”) is now “old school” and passe. But if you want Windows 7’s Control Panel to be more detailed, and look more like XP’s did, change the “View by” to “small icons”. I appreciate your taking the time to let me know you found my writing beneficial. 1) Uninstall the keyboard in Device Manager, as described here: What To Do When Your Mouse Plays Dead. Or Your Keyboard..
2) Search the Lenovo user forum and if you don’t find an answer, post this question there. 3) Have a tech take a look. If the whole range of keys intermittently stops responding, you might try uninstalling the keyboard in Device manager, then reboot. If the problem continues, and the laptop is new, call HP support. You might have a defect. I have windows 7 home premium on my computer. all was well with the keyboard and now thhere is a click sound each time a key is pressed. No letter shows up on the screen unless I hit the key for 2 clicks and then it appears very slowly. PLEASE help me reset the keyboard to normal.. I have a Dell system. In my other answers, above, you will see – several times – links to another article (“What to do when your mouse plays dead”). You can try the uninstall technique described there. But I don’t want to alarm you with what I say next.. if the machine is still under warranty, call Dell. If it’s not, you may want to have a tech take a look. Thank you. I type faster than my keyboard was allowing me to, and it seemed to happen all of a sudden, and I read the above, and it’s fixed. I can type as fast as I want and don’t have to hard press on keys or wonder why accessibility comes out with only one “c” and I have t go back and add it in. Many thanks. I didn’t know this stuff was here, but apparently I did something somewhere along the line. New Windows, new computer. I’m happy now. I am very glad to have helped out. Thank you for letting me know I helped. I am using Windows 7 Home Premium on an ASUS Notebook UL50a. The keyboard allows me to type fluently and fast, but after a few words the cursor moves sporadically to a random place somewhere else on the page. Very often, the text that I have typed is highlighted and then disappears with the next keystroke. I am a fast and accurate typist and have never encountered this type of problem on any other keyboard. It is making the Notebook unusable. The settings above are ok. I would really appreciate your help. You might try adjusting the “repeat rates” of the keyboard (Start > Control Panel > Keyboards & Mice). And you might also try watching to see if your wrists (or bracelets) are brushing the touchpad, and or the left hand ‘function keys’ (Fn, Ctrl, Windows key, Alt). If so, you might need to turn off the touchpad and plug in a mouse. Well, Fn+F9 should work, but I found a reply in a forum that said to try Fn+F10 instead. open Control Panel and select Classic View (for easier approach), click for “Mouse” which will open the mouse properties, and look for the tab with the word “ELAN”. Click the tab and look for the check box that says “Disable when external USB mouse plug in”. Check it, press Apply then close. You can also disable the touchpad here for good by selecting “Elan Smart-Pad” at the list and clicking the “Stop Device”. If those ideas don’t help you, you can “disable” the mouse (trackpad) in Device Manager (again, Google). I first had to go to the Asus website and download the Elantech software. Then I was able to do as you suggest and disable the touchpad, Great – thanks a lot for this. And so far it seems to have done the trick and my problem is solved. Thanks a lot!!! I suspected that you might have to download the driver.. but wasn’t certain (and didn’t want to daunt you with TMI, should there prove no reason). Thank you for letting me know the fix. Congratulations on solving the puzzle! I hope it proves a permanent cure. If you read my answers to people’s questions (above yours), you will see a pattern of three things to try starting to repeat themselves. If you read my replies to questions above yours (in the Comments section) you will see a pattern — of an article, and a few things to try — emerge: check for viruses, uninstall the keyboard in Device Manager, etc.. I know there are many comments, but it won’t take you long to skim them. I think your answer will be in there. thanks I had already read the hole post and tried everything except totally uninstalling keyboard so I did that b4 riposting. to many keys are involved for it to be a dirt problem, and it does same thing with an old crap board I had laying round. does it sound like maybe an input card problem or software to you? I apologize. It seems my “read my other answers” response was inappropriate in your case. And I thank you for pointing out the broken link, though I doubt a device driver is the issue (and uninstalling [all] the keyboards in DevMgr should have removed/reinstalled a/the driver anyway). The link should work now. And I might uninstall all keyboards in DevMgr once again. I have found that sometimes I need to repeat actions two, three times before they “stick”. Did you make any changes in your BIOS? well I thought I would fill you in on the latest. I removed my hard drive and replaced it with another one I had around that had windows xp on it. to rule out either hardware or software. (if it continued it must be hardware — if not software). i lucked up and found the problem. i was trying to configure my razor naga gaming mouse. and when I hit one of the side keys it started filling the txt area I was in with 0000000000000 as it had before. when I hit any other side key it would stop. It has been the mouse that was malfunctioning all along, and since the naga’s extra keys mimic keybaord keys this is what you get. I even think I remember setting the naga to past the clipboard at one time in the past. Well, that would be under the heading of “mapping” (and also “undo any recent changes” [aka “configuring my mouse“]). I am glad to hear you puzzled it out, and I thank you for the update. I join you in hoping it helps some future reader. If you read my replies to other questions (above) you will see the things to try (including reference to another article/technique). But if you have already tried those things, well, if the laptop is new enough (1 year) you can contact ASUS’s support. If it is out of warranty, you should have a tech take a look. In Windows XP, execute control access.cpl from the Command Prompt to access Accessibility Options directly. In Vista/Win7/Win8, execute control /name Microsoft.EaseOfAccessCenter from the Command Prompt to access Ease of Access Center directly. Hello, kind soul. I’d google this if I could, but I don’t have the slightest idea of what exactly to search for, so please bear with me and help me if you can. My laptop has an odd case of sticky keys. Every key I press is followed by a phantom m stroke. K turns to km, a to am, all the ctrl and function keys result in an m as well. If I press m by itself it tends to behave most of the time, except for when it throws up a bunch of ms. I thought it was windows being weird, but a restart didn’t help. Taking the button off and cleaning the accumulated fluff didn’t help. This article didn’t help. I’m at a complete loss. Any ideas of what could help? Or should I just assume the keyboard has died and get it replaced? I’m running Windows 7 home premium sp 1 on an emachines laptop that has seen better days. I have added supplemental answers in questions posted above, and these answers may answer yours — I’d suggest starting with Comments 27, 29 and 32. Thanks to a required high school typing course in 1972, I am a speedy touch typist. Unfortunately, my keyboard cannot always keep up. It often stops typing as my fingers continue to hit the keys. I have to go back, left click where it left off, and re-type. (Just happened again!) I have a new Asus “Republic of Gamers” laptop with Windows 8. No sticky keys or any other filter keys are being used. Thank you, by the way! If I understand you, the machine actually ignores/forgets your keystrokes after some point, and you have to go back and retype (as opposed to there just being a delay between keystrike and letter appearing on the screen). I think I would have to look at your problem to give a better answer. But I can tell you it is a problem: a new gamer should not have that. My suggestion is to visit Trend Micro’s online scanner Housecall to look for any malware. If the problem persists after that, contact ASUS. I can assure you your troubles are not related to the Accessibility Option named “Sticky Keys” (the subject of this article). But as to why your computer suddenly started acting so strangely, there might be several causes, ranging from hardware to software. The first thing to try (always) is a reboot. Then I would suggest downloading and running MBAM (http://download.cnet.com/Malwarebytes-Anti-Malware/3000-8022_4-10804572.html) to look for viruses. Then I might try uninstalling any recent software changes (starting with GOM Player). Then maybe do a System Restore. If those don’t solve it, have a tech take a look. Thank you soooo much! I couldnt type multiple of the same letter at once, but this helped me a lot to fix it! Thank you for taking the time to let me know you found my article helpful. My keyboard is acting funny. It was working a while ago but suddenly something has happened (i doubt that I have pressed some key). Some examples–desktop coming when I press key D, “my computer” opening up on pressing key E, the window size reduces on pressing the down arrow key, increases with up arrow key etc. Therefore, I am unable to type anything. Cannot even google. PLEASE HELP. Sounds like your Windows key (bottom row, left) has become stuck down/’activated’/’toggled). Try pressing it once, and if that doesn’t cure your sudden change, reboot the machine (restart). See my comment #39 (above). If that repair doesn’t work, substitute “fujitsu” for “lenovo”. And if you’re still under warranty, call Fujitsu tech support. (If not, take it to a tech). Very first thing to do with a new oddity = restart the computer/digital device. If that doesn’t clear it up, proceed to troubleshooting. Next, If you recently installed some new keymapping software (such as with a fancy new mouse), or plugged in second keyboard, uninstall them. Next (presuming no luck) refer to my answer comment #39 above. If you read my answers in the comments above (yes, I know, there’s a lot of them), you will find several repairs you might try. There is also (several times) a link to another device repair article quite appropriate to keyboards, as well as more answers/repairs in that comment section as well. Good luck. My external keyboard which i used to use for playing games worked fine till yesterday but today it is showing some unusual problem. When i press shift tab button they function like caps lock. Typing the alphabets button also resluts in some random inputs when pressed. what can i do to sort this out? Like the last two commentors, I am going to refer you to previous answers I’ve given in the comments (above), particularly Comment #39.
which one is the comment 39? my original keypad is working all but fine and i have problem with only the external keyboard. The comments are numbered (yours was #57). I have given answers previously that may help you. But to be clear, uninstall any keybord mapping software, and uninstall the external keyboard in Device Manager (there is a link to my article for how to do that in my reply to comment #39.). That’s one I haven’t heard before.. only one letter, and only in your browser? If it happened in other programs, I would suspect a malfunctioning key (mechanical). If you read my answers in the comments above (yes, I know, there’s a lot of them), you will find several repairs you might try. Good luck. when I touch ‘control’ key, I am knocked offline. Every time; also text on websites is jumbeled on top of itself badly. I would have a pro take look at your machine. Do you have a search feature?? Yes, in my widgets column on the right. It’s labeled “Previous tips and answers”. I have a Sony laptop, running Vista. Just recently the keyboard started ddoouubblliinngg every keystroke if I’m in Firefox or Internet Explorer. I am typing this post in Notepad to copy and paste, and it works fine. I also tried WordPerfect. Problem is ONLY in browsers. This is really giving me a headache. Do you think I have a virus? That is one possibility, I think. A good way to check is to visit an online AV scanner, and I start with Housecall. You can also try “Reset”-ing the browser. My How To for that is here. I tried Housecall, but I was unable to install it. I got a message that it was corrupt. Huh! But it looks like my existing anti virus must have taken care of it, because the problem has left the building. Thanks again. I’ll be checking out some of your other helpful posts in an attempt to educate my non-geeky brain. How right you were to be suspicious. The problem is bbaacckk and I can’t get Bitdefender to run either. I have the name of a local computer fix it shop with good referrals, so my next stop is there. Thanks again for your help, not just for me, but for all the others you help too. I think thats the right move. When you get it back from the shop, it’d be wise to change all your online passwords. My keyboard has a problem. I am a gamer, and not only do i like pc and console games but also flash games, such as those found on armorgames.com. Anyhow whenever I play a flash game that uses wasd or arrow keys, sometimes whenever i press the proper key it sticks. Like if in order to move left you press d, whenever i do so my character keeps moving to the left even though i pressed d again or tried pressing other buttons.I have found that clicking the right mouse button and the corresponding key helps a little but the problem is still there. Edit: My moniter is hooked up to a labtop because the labtop screen got messed up somehow and now the screen is white and in the lower right corner theres some weird black ink-like stuff, and some of it is highlighted in blue. So I plugged in my montier into it so i could still use it, so i plugged a keyboard and mouse into the labtop so i could use both in conjunction with the moniter. The keyboard im using, not the labtop keyboard, is the one thats malfunctioning. Thanks and ill try those remedies. Recently the labtop power moduel (that thingy that the cord goes into) got messed up and now wont charge unless the wire or the lab top is in a certain position. As for the key thing i dont know how old it is because were renting it. What i do know is that its an acer hp labtop, if that helps somewhat. Well, if you mean the power jack on the laptop itself (the ‘socket’ the cord’s plug goes into) got broken and is now loose in there.. that part is often soldered directly onto the mainboard (aka “motherboard”). A shop could disassemble the laptop and resolder that.. might clear up a few issues (maybe the screen, even) and .. I wouldn’t delay. It’s not going to improve by itself, and might get worse (as in unrepairable). But I’m not clear.. the laptop is a rental? Try pressing the Function key once (sometimes labeled “Fn”). If that doesn’t work, you can try contacting HP customer support; and/or also review the answers I have given in previous comments (above). I’m currently having trouble with my computer my younger brother was irritated with it and I’m not sure what he did but he made it where my computer makes these weird bloop sounds and kind of sounds like a video game everytime I type and the spacebar wont work and I need my computer anyway you can help please do! Well, that’s one I haven’t seen before.. It almost sounds like a ‘macro’ (or maybe a custom “theme”) has been set. my com puter keyboard is totype specifically a,q,1 in this characters to typing to auto attached (-) symbol it is how to solve the problem? How do I disable sticky keys on my computer when I can’t type in my password? If you already replaced the keyboard assembly.. You might try going in to Device Manager and “uninstall” the keyboard and reboot/update the driver/replace the keyboard’s ‘ribbon’ cable/take the machine to a technician. i donot know why some times is defect (gapes or spaces), other times not. And thank you for the follow-up. But one thing.. you said (maybe it was a typo) “if u believe now it is working without fault“. I never said that. Only you can say that. Intermittent bugz (glitches) are sometimes called “ghosts in the machine”, and they’re just as hard to find and fix — the bane of tech support technicians. The answers I provided in the article, and to previous questions, (posted above) similar to yours, should help. Thank you so much! My keys were suddenly acting up and this article explained perfectly what had happened, thanks for this! Totally fixed my problem, I guess I accidentally turned on toggle keys! Great website, really appreciate it. If I drag my finger across the touchpad it scrolls up and down the page. The only way I’ve found to be able to actually move my cursor is to hold down the left mouse button, but then everything gets highlighted and sometimes things get accidentally moved. Can you help? Thanks! In my answers to previous questions (above) I mention (and link to) another article I wrote that tells you how to uninstall the device driver. I would do that for the touchpad. If that doesn’t work, you could plug in a wireless mouse..
Or have a tech take a look. hello there, there’s a problem with my number ‘four’ key, i can press the other numbers with ease (123567890) but not ;four. and sometimes i will get random strings of ‘fours’ coming out. Do you have any idea what might have caused this issue? i am using a laptop and have clean the key but its still not working. Please read my answers to previous comments/questions (above). tks for getting back to me so soon, i went to https://techpaul.wordpress.com/2010/04/19/what-to-do-when-your-mouse-plays-dead/ and read it up but ‘ A yellow triangle with a black exclamation point symbol will indicate a problem with the device.’ There’s no yellow triangle or black! anywhere with any of my device(mouse or keyboard). do i still go ahead and uninstall them ? That will (re)Install the device driver. Which will either resolve your issue or tell you that the trouble almost certainly is mechanical (and you need a new keyboard). Thank you! This helped me fix my problem!! And thank you for taking the time to let me know you found my writing useful. I have a lenovo thinkpad SL500. I had to take it apart to replace the power jack. Once everything is back in place it works beautifully, but one issue. The “D” key is way too sensitive. It is the only one behaving this way. I took the key off and cleaned away anything obstructing and it still is too sensitive. It does not stick. Did I miss something when putting the keyboard back on? Thanks! I doubt it. I have not disassembled that particular notebook, but my thinking would be more along the lines of a long screw – such as the one on the bottom that comes up through and holds the keyboard unit in place – may have been over-tightened, and needs to be backed off a twist or two. But it sounds like a replace the keyboard, or live with it, kind of .. quirk. I am working with an Acer Aspire 5253 with the built-in keyboard Windows 7. For 2 weeks now the Left-ALT ESC FN F3 F5 F6 F7 F9 F10 and F11 keys do not work in Windows or applications. Sticky Keys, Key Filters, etc. are off. The keys appear to work correctly with a USB keyboard although I haven’t tested everyone. I have Dritek WMI loaded as well as Acer Launch Manager. Are you aware of a specific issue that can cause these keys to fail? I’ve searched the web for situations similar to mine and they appear on a sporadic basis. 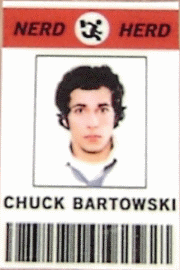 All or a subset of the keys mentioned fail in the reports. After 2 weeks of looking for a solution, I don’t know where else to look. The problem is months old so system restore is not an option. Nothing like an intermittent glitch to drive one nuts, right? I uninstalled the keyboard a few times and no help. I can plug in a USB keyboard and it works correctly, so I’m assuming it may be software related. Maybe I have an incorrect version of Launch Manager installed. Thanks for the suggestion. Yes, more likely. But hardware (the keyboard assembly or ribbon cable) is also possible. If you did any key mapping, undo it. Reinstalling the model-specific Dritek WMI and Acer Launch Manager from the Acer website is a good next step. The only trouble I’ve had on my 5253 was LCD screen related; which I almost didn’t replace, as the machine is old, and cheap (lowest-end) to begin with. But I see a keyboard assembly for $20, so.. If it’s a bad enough problem, you could copy off your files, do a ‘factory reset’, and reinstall/copy back. I am trying to help a friend with her Acer Laptop. It is running Windows 7. She said that “her babies” got hold to it and were banging on the keyboard. It was displaying weird stuff when you mash the keys, ie; letter o with’ off the side, letter h with the u coming up right beside it, letter j with the m coming up abd others stuff. The / key acted like it was sticking, so i checked and turned off sticky keys. I have also uninstalled the keyboard in Device Manager and even after re-installed, it continues to do the same. ONE NOTe, i took the / key off, cleaned it and re-installed it. Not seeming to stick any more, BUT, all the other issues still there. I plugged in a USB keyboard and it works fine. SO, am I correct to assume that the keyboard itself, may need to be replaced ? Yes, I’d say it was a safe bet. Fortunately, keyboard replacements are not too expensive, ($30 or so) and a fairly simply ‘disassembly’. thanks, yeah, i have done a few of them. My computers keyboard is not functioning correctly. I was using the Internet and tried to type in something and before I finished it automatically switched back to Google home screen. I kept trying with the same results… so after that I typed in letters one at a time so that I could see with keys were affecting the search. The only key that acted up was my c letter key… after each time I pressed it it sent me back to the home screen… I have been researching what it might be with no luck except everyone saying it is the sticky keys, I have tried the solutions to sticky keys with no luck… the keyboard has a few years of use on it but has never had any problems before that. I am starting to think the keyboard has just gotten to old and needs to be replaced but I would like to know if there is a way I can fix it and I can’t use certain programs until I fix it… please help. In my replies to previous questions, (Comments), above, I have already provided the complete DIY repair options (including a link to another keyboard repair article). Read those and, good luck. It was very helping reading this article.My queation is about my android phone.It just has happened with the keyboeard of my samsung note 3 android phone.the problem is that while typing when i tape on asingle so it taped on mre letters with yhe letter i tap first.so whats this kindly let me know soon and what solutions are there. I don’t know. But the Standard Troubleshooting flowchart should help. 2) Do a “hard reset”. 3) If under warranty, contact the device manufacturer. If not, read their FAQ and Support pages. 5) Have a Tech take a look at it. I don’t understand your writing. But I can tell you to refer to my previous answers in the Comments above; or call HP tech support; or take it to a technician. I have a new Acer, Aspire E 15 Start ES1-512-P8NA I usually useaplug in keyboard butbecause this one has an “on board numeric pad” I have done away with it. My problem is the space bar is not working properly. I type away, tapping it both soft and hard and it doesn’t space the words all the time and I have to gobackeach time and separate them. I am trying to gather some samples for you while writing this but it has only happened a couple of times but maybe that is because I am not typing at my usual speed. What can I do itisdrivingmecrazy! First I would use compressed air/soft brush under the spacebar to make sure there’s no little bit of grit/dirt interfering with the motion. Then I might go into Control Panel > Keyboard and fiddle with/adjust tyhe “repeat rate” sliders to see if quickening or slowing better matches my typing.. I have posted several DIY repairs in previous Comments (above), you could try some of those.. But since you said your machine was new (meaning under warranty) you could contact Acer tech support.. maybe there’s a defect. Though Microsoft has “modernized” the control windows somewhat, so they look different, the Ease of Accessabilty function has not changed. You simply need to turn off Sticky Keys… and get your own computer for games. Go into Control Panel, then Ease of Access Center, then “Make the keyboard easier to use”. hello, i have this problem on my keyboard that when i press any button and hold it for a couple of seconds, it repeats itself for a couple of more seconds. do you know what the problem is? Doesn’t sound like a problem. It sounds like you need to adjust the “repeat rate” to something matching your expectations. You violated protocol/etiquette by not stating the type of device you are referencing.. but in Windows PC’s, that adjustment is found in the Keyboard section of Control Panel (which you may have to change the “view” to “icons” to easily find), while in Macs it’s found in Preferences. Hi something hapened to my computer… When i try to type something It wont typing but when i press the button In the browser or anywhere the tool bar settings on.. For example In top of the browser are File Tools and… ant at the serch area Itrying to type for example Fools and then the file options show off . When i try to type T.. and again shows Tools options show. If you understand what i Trying to say please help. Nobody should be using XP any more. That said, follow the instructions in this article to make sure none of the “Accessibility” functions are enabled, and then read through the Comments (above) where you’ll find all the DIY keyboard repair techniques. Hi. Some help would be appreciated. I bought a new laptop- HP Pavilion15-ab032TX which comes with Windows 8.1. I only can explain my problm very elaborately.So please be patient. When I play a game on my laptop the character should only move/walk when i am holding any of the arrow keys and it should stop moving as soon as i release the key. But some time it so happens that even if i have released a key, the character keeps on moving in that direction unless i press the same key again. I use W,A,S,D as the arrow keys. Please help me sort this problem out. In Windows, the adjustments for keystroke/keyboard are found in Control Panel > Keyboard, and the Ease of Access Center. I would start my ‘tweaking’ by going in to the latter, and making sure that Filter Keys was off (unchecked). If that doesn’t resolve it, try adjusting the other settings. If that doesn’t help, contact HP. I think maybe autosuggest is getting in your way. Try going in to Settings and turning that off.. see if it doesn’t behave more like normal. Another thing you might try is taking it in to the store (you bought it from) and showing them what it’s doing. Another option is to call Lenovo’s tech support; or post this question on their User Forum. Thank you for taking the time to let me know you found my article helpful. Glad it resolved your difficulty! Um.. on all my keyboards, Shift+7 does place the &. aswell shift plus underscore now becomes a question mark, and instead of alt gr + 2 becoming @ it becomes nothing and shift + 2 works instead. and wierdest of the all shift + 6 becomes ^ really wtf. Well, okay. My answer is the same: read my previous answers in the comments above. I have now scrolled trough all answers above and i can’t find anything that can help me. If you read the two other articles referenced, and the repairs mentioned, in comment replies did not help, have a tech take a look. The touchpad on laptops have a “scroll slider”, usually along the right edge. Maybe you are accidentally resting (or brushing) your hand there? I have written three keyboard articles, and provided several tips/repairs in the comments. You might find a repair there. Or you may need to have a tech take a look. Yes, going in to Device Manager, and Uninstalling (or “disable”-ing) any keyboard other than your main one, is one of the “answers” provided in my previous “Comments”. I’m glad you solved your trouble, and thank you for sharing. My keyboard suddenly got tHis issue wHere I HaVe to Hold sHift to use V, H and C. Can you Help or suggest a fix? EDIT: THey work in my search bar without HaVing to Hold sHift. Um… you may have set a “macro”, or accidentally “mapped” those keys.. so you may want to look up “how to undo” those things. Also, in previous Comments (above) I have provided the DIY repair methods for keyboards. You can read through those. I am astounded by the number of people you have helped. Really impressive work. I like to dig up solutions to my tech problems on my own, so i wouldn’t be asking directly if i had been able to find anything like the issue i’m facing. I think it’s really novel, hope you can think of something though. I just bought a new plug-and-play, wired keyboard to replace my old worn-out one, and they’re of the same model. Everything is working fine EXCEPT the secondary “&” symbol (shift-7) gives me nothing (i typed that using the on-screen keyboard). Get this, the physical key itself seems to me to be working cause i’m typing the primary “7” perfectly right now. The previous unit did not have this problem. – I’ve checked my installed languages/keyboards in Control Panel, removed English entirely and re-added it with only the US keyboard and Ink Correction with default settings. – I’ve gone to Device Manager and uninstalled all the Human Interface Device drivers then unplugged and replugged my mouse and keyboard to make them re-install their drivers automatically. – It’s a Microsoft product so i’ve gone to the Microsoft support site, downloaded the latest drivers and re-installed everything with default settings. – I’ve gone to the Ease of Access Control Panel and ensured all keyboard Accessibility functions are disabled. I can’t go to tech support for help because i have no warranty. Any ideas? Well… aside from taking it back to the store for exchange, no I can’t think of anything. You’ve done a comprehensive set of troubleshooting steps. Sorry I can’t be more helpful. Ah darn. Thanks anyway. What do you think could be the underlying cause though, hardware or software? If you can plug it in to a different computer, you can (usually) determine that. But I can’t tell you that from here. Hi Paul, just to keep you updated, my problem somehow resolved itself today, which is 6 days after i first plugged the new keyboard in. When i first wrote, that was the first day of use. I put it down to a new device shaking off the dust of storage and sorting out its teething problems. Thanks for the help anyways! if I type on ms word, file name, prg. result of my laptop, some falsh slashes are typing there like ////////////// and it happen before typing any letter . how release from these problem? I’m not sure I understand you.. But it may be that that you have set a “macro”, or altered the “normal.dot” file. I suggest you start by trying to reset the “new blank page” (aka Normal.dot) as per my old tutorial, here, https://techpaul.wordpress.com/2010/01/05/how-to-make-word-open-a-normal-blank-page/. If that doesn’t clear things up, Google “MS Word remove macro”. I spilled wine onto keyboard and a number of letter keys stopped working. However when I switched computer back on this morning some had started working again. How long should I wait to see if they are all OK? I am currently using an external keyboard and mouse and this is working fine. The spill was about 3 days ago. Would welcome your advice.I don’t want to have a new keyboard installed if its not necessary. Thanks. caroline ford, I doubt giving it more time will restore it to full functionality.
. The only ‘trick’ is making sure you get the part, and the guide, specific to your make and model. Thanks for your advice. I’ve had a very reasonable quote for replacing the keyboard. Just didn’t want to do it if there’s a chance the laptop will dry out and recover! Um… did you follow the steps outlined in the article? And thank you for taking the time to let me know my writing has been helpful. Thank you!!!! I was bafflled, (and so was my husband) when I tried to type and it would make a ticking sound, but not type anything. But if I held down the key, it would work. (It would also work when I needed to type in my password after start up). I googled the symptoms and your article popped up. Sure enough, the filter keys option was turned on. Turned it off, and it works!! Hooray! And thank you!!! Thank you for taking the time to let me know I helped you. your question is exactly like the scores I have already provided answers to in the comments above.. and i provide links to two other articles. Read those. Try those repairs. Maybe you’ll have luck. But since keyboards are mechanical, it may prove that you’ll have to replace the keyboard. Good luck. hello friends… i have a serious problem in my laptop keypad. actually my friend took my laptop for seeing movies. after he return my laptop the “print screen” button on my laptop seems to be always pressed and i cant do anything such as cut, copy of any files. if i am trying to copy a word doc means after copied and while pasting it to the destination system do paste the screen shot of the current window only but not the copied word doc. i cant do anything with this. when i checked, my friend newly installed kmp player in my laptop. also my lap is getting hang very often. i am using Lenovo laptom and windows 7 OS. kindly help me to get ride of this issue. awaiting for the solutions. please help me …. Thank you…. Take your laptop to a professional. (or call Lenovo.) Your problem is bigger than a ‘stuck key’ on your keyboard. I could say also, your friend should pay… and never let others touch your devices. Hello, Paul. I have an optical wireless mouse and when ever I plug it into any of the 3 USB ports on my laptop the volume goes all the way up. Trying to lower it, either with the icon or the key board, only results in the volume going right back up. Everything is fine though if I unplug the mouse. I’ve tried rebooting the laptop, updating the drivers for the sound and uninstalling the mouse as well as the speakers but the problem persists. The laptop is an Acer Aspire, probably 4 year old, and I’m running windows 10 (thanks to the free upgrade). I’ve had the upgrade for at least a few months and the mouse for nearly a year but the volume problem started last night and I wasn’t using the key board when it started. Oh, and it’s the same when I have the head phones plugged in too but I didn’t have them plugged in at the time. I’d be ever so grateful if you could tell me how to fix this. Huh. That is a new one on me. Did you install a new app or program last night? If it proved to be the laptop (i.e., if you plug a different wireless mouse in, and the same trouble exists) I’d next try uninstalling the USB controller(s).. And then I’d quit trying. I don’t spend too much time or money on old machines. On my laptop keyboard, when I hit “O”, it responds as if I am hitting “Enter.” How do I fix this? Your question is exactly like the multiple dozens I have already provided answers to in the comments above.. and I provide links to two other articles. Read those. Try those repairs. Maybe you’ll have luck. Good luck. Please read my previous answers in the comments above for more repair methods. If those don’t help, have a tech take a look. Please read my previous answers in the comments above yours. My keyboard is working perfectly in other programs, however as of yesterday when using Microsoft word 2010, it gives trouble. I have to be constantly pressing keys to type their assigned letters. It has made typing in word a task as I have to constantly read back an ensure no letters or numbers are missing from sentences. Please help! I don’t know what happened. It was working fine the night before and the problem is only when using word. As always, the first thing to try is a reboot (restart the computer). Then try (briefly) pressing the Shift and F1 keys (together same time) and then let me know if it worked. If it didn’t, I need to know if you are on a Mac or a PC. Hope you can help, my keypad and left and right arrows key have suddenly taken it into their minds to play up. With Nu Lock on, pressing the number 9 key or plus key gives me 9+ on one key press. Pressing the left arrow key gives me a hyphen and the up arrow key gives me a full stop. I’ve checked keyboard languages, key board setup and sticky keys, all to no avail. Any help you could give would be most welcome. I’m sorry I don’t have a specific answer for the symptoms you describe. I can only suggest you read through my previous answers in the comments above (I know there’s a lot of them). So i read all the comments and your article and i have googled this problem alot but cant seem to find an answer. My keyboard works fine plugged into and other PC its a razer Anansi and im using software version 1.18. but on my pc when i try to use it, i lag or sometimes a key just wont respond till i push it 5 times then it only puts in 1 letter/number. its not a constant thing. happens at most 1 time every five minutes. or whenever i seem to be typing in a password. except my UPS but it shouldnt cause anything like this. the wierd part is that when i was at my old desk i never had this issue. but now that my new office was completed and i have move into it, i get this issue. hoping you’ll have some ideas for me that i havent already tried, because im out of ideas. No its a wired keyboard. it even uses 2 usb slots itsself. but yes it is right next to my wireless/wired razer mamba mouse. my wireless phone, and bluetooth speakers. Al the wires go through the same desk grommet on my desk. do you think the wires being so close like that(magnetic field?) + the wireless devices next to it are causing interference? i havent tried the sensitivity but i cant find a setting for it in windows8.1. Well, I don’t use Win8, so a quick google search for that. (But I believe the built-in Search, start typing “keyb” will get you there.) As for EMF interference, I believe its possible.. I guess. Another possibility might also be small break (a “short”) in the cable itself… A process of trial and error might find a happy result. Try moving/adjusting things.. Not sure what else to advise, frankly, besides a new keyboard maybe. When typing all of a sudden I was getting all kinds of symbols, rather than the letters typed. What did I so? Read the comments above yours for answers I’ve previously provided. Good luck. Issue is keys are delayed when pressed. Now if I hold any one key they all work normally. For example if I just hold down ctrl and type every key types right away. If I release the ctrl key then they are all delayed once again. I’ve checked all the sticky keys, Accessibility Options, and filter keys. Nothing is checked. I’ve even gone as far to restore to factory. Wiping all data. Nothing so far has worked. Any ideas what could be the problem? Not really, no. What happens if you plug in a USB keyboard? yes it works if i plug a usb keyboard in. although the usb keyboard will beep randomly when i press some keys and its not always the same key. Well.. go into Control Panel > Accessibility Options > Make typing easier and make sure all options are disabled/off. If that is a no-go, try (after unplugging any USB keyboards) going into Device Manager and “uninstall” the keyboard and reboot (google search “device manager + uninstall + Keyboard” if you don’t understand my instruction). If that’s a no-go call the manufacturer if you’re still under warranty, or post your question on their make/model User Forum. Hi, I’m using Acer Aspire E 14. I’m not sure what I did but my arrow keys are not scrolling but instead adjusts the brightness/volume of my laptop. If I press Fn then it will scroll but this activates numpad then I have to press Shift to get it back to normal. Any help on how I’ll be able to scroll and type normally without having to use Fn or Shift? Thank you in advance. Yeah… Sorry but I’m not sure what you did either. I am only vaguely familiar with this issue, thanks to people who wanted it set this way (gamers and Media Center PC) a while back, and then you had to install key mapping software to do it. You might search on/post this question on the Acer forum (or if still under warranty call them). It may also help to go into Accessibility Options and UN-check every keyboard-related option. there is a problem in my laptop as when I press any key there appears a dash on it like á and also hash before any alphabet /k…… will it please tell me what is it? First thing I’d do, though, is go into Control Panel > Regions and languages > Change keyboards, and check to make sure the language is set to your native language.. If that wasn’t the issue, I’d contact the laptop manufacturer (if still under warranty) or look in their FAQ’s, support, and user forum. Thank you for taking the time to let me know I helped out. i`m using an LG windows computer with a DELL keyboard in my school and i was trying to get the caret key by pressing ctrl, shift and 6 and i guess i accidentally pressed the ctrl button to or something else and now, shift and 6 is giving me this `?` while the forward slash which should normally give me a question mark is giving me `É`. I cant even use the inverted commas again. its like all the keys i get when i combine them with shift have become messed up. The caret is simply Shift+6. If I understand you, it is the school’s computer? Tell the teacher. If it’s your own computer, you can read through my previous answers in the questions already asked above yours. Good luck. thanks! i read through but i didn’t see this particular problem. i normally use shift + 6 for the caret but i think i accidentally pressed ctrl and shift while trying to get the caret. after i pressed that, a lot of my signs have changed. i cant get a forward slash again i get this instead é and my inverted commas i just noticed have shifted to shift + full stop and comma and my curly brackets give me¨¨ÇÇÇ when i use shift with them. this is not the firs time this is happening. the first time, i thought it was a fault with the computer but now similar thing is happening..
Reset your keyboard language, and go into Accessibility Options > Keyboard and make sure everything is unchecked. If those don’t work, the other techniques in previous answers may. try plugging in a USB keyboard.. if the attached keyboard behaves normally, you know you have a bad (onboard keyboard) and you need to replace it or have a tech do it. If it does the same thing, your computer has a problem and you should have a tech take a look. When 2, 3, “.”, right ctrl, numpad 9, numpad 2, numpad +, f9 right arrow key is pressed, it keeps flashing around different parts of the screen extremely fast. It is a brand new logitech k120 with drivers all up to date both for computer and keyboard, and power management is turned off on usb input devices on device manageer. Have tried turning off computer on and off too, works only for a while. Happens whether on chrome, windows or ingame but works fine on discord only. Thanks for your help if possible. when click a button on my keyboard it keep typing even when i remove my finger (i stop clicking) what should i do? Scroll up and read my previous answers (“Replies”) in the Comments (above). Your question has already been asked a few times. Also: when you ask someone for help, you have to tell then WHAT KIND of device (the normal way is to state Make & Model) you have. I typed a 6 and I get a 56. I think the letter characters are fine because I was able to type my email address but typing the numbers, brought up multiple numbers but not the same number. I turned off my computer as I’m worried that it’s because I wiped the keys with a wet tissue. Let it dry more than thoroughly before turning it on again. Good luck. I just turned it on now, hoping it would be ok by now. At first I tried the numbers and characters and I thought it was fine but then I typed r and found out that I got r6 and if I type y, I get y8. :(. I depend on this laptop and I can’t afford another laptop or pay for repairs. I turned it off again. Do you think it will work if I wait some more or there’s no point? Thanks for your help techpaul. The problem is no longer there. I thought I should give an update. I told a friend about it and she sent me a web link of someone else having the same issue with getting those certain letters returning y8, r6 but their problem went away on it’s own. I hoped that it would for me too but I waited days and I still had the problem. I kept it turn off for days with no power with the charger unplugged and i also tried to blow dry it with a hair dryer lightly and then left it turned off more hours and after waiting so long, I finally I turned it on but the problem was still there. Then the next day I took the laptop to a friend to uninstall a security firewall that was installed a couple of days before. She also had an external keyboard which worked which worked properly. But my keyboard still didn’t work and I found that typing l, produced l9. And also that if I typed 6, 8, and 9, it would print out r6, y8, and l9 which I didn’t notice before. I turned off the keyboard each time and let the battery drain out, I went to the computer repair shop ask for a cost estimate to replace the keyboard. By the 6th day, I also found other keys that didn’t print out with the shift key. For example, I could type e and r but not shift capitals E and R but typing Q worked and not left curley brace and many characters just didn’t print with the shift key. I was worried that what if I replaced the keyboard and it still wouldn’t work. I even thought that I would have to pay for a diagnostic test. I turned it on because there was no point waiting it to dry anymore and the problem was still there. I turned it off. Then I think 2-3 hours later, at 2am, I turned on the laptop without thinking about it and all the keys worked. What a relief. I’m glad it works but I still don’t know what happened and why. I was having several issues with my keyboard and have been able to resolve all of them by reading and implementing information from your blog………. THANK YOU!!! However, one issue remains….. when I’m typing my k eyboard enters spaces whenever it feels like it!!! Examples are within this paragraph. Either it will enter spaces where I do not what them, or NOT put a space between words. I’m a very quick typist an d having to constantly correct this is a pain. I’m hopeful you can be of assistance. Whenever I’ve heard this complaint, it is from a ‘very quick typist’. The first thing to do is try typing very slowly (for you.. what others might call ‘normal’ XD ) and see if the issue remains.. if so, repeat the experiment, but try going even slower.. if it still remains, you might need a replacement keyboard/pad (not a terribly big deal, actually). If it proves that your speed is the issue (the computer’s just not keeping up), Go into Control Panel, Keyboard, Keyboard Properties, and try adjusting the repeat rate, and repeat delay. It may be that your wrist/jewelry is brushing the spacebar (or, ‘trackpad’) .. removing bracelets, slightly shifting your hand position may help, too (maybe disabling the trackpad, if that’s the culprit). Please let me know if you have any advice! Thank you!! I was having trouble with the first letter not typing until I hit the key twice(very annoying) I even bought a new keyboard. After running adaware and malwarebytes(which picked up 9 problems but did not affect this one) I started d/ling and reinstalling programs. I discovered my “Tor” browser was interfering with my Firefox(or vice versa) either way I reinstalled both and my problem was solved. Thanks for the guidance Paul, it was greatly appreciated. I am using a Logitech K330 series keybord… some of my keys are working strangely, caps lock keys press shows numeric 8, Down arrow key press alphabet D appears, Esc key is working as help function key. please help. Please read my previously posted answers in the comments above. I HAVE DISABLED COMMENTS AS I HAVE NO NEW ANSWERS, AND YOUR KEYBOARD PROBLEM IS NOT SPECIAL – I’VE JUST BEEN REPEATING MYSELF.